Black net mitts embroidered on hand with a flower flanked by small buds. List of passengers who sailed on the "Audley Clarke" to California on February 15, 1849. "California" is at the top; decorated black and white border. Wood frame. 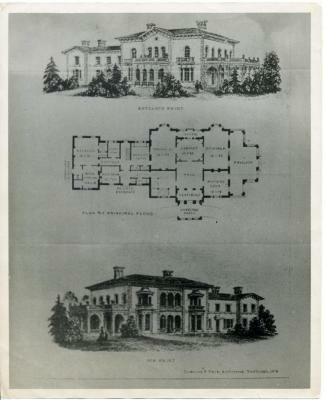 Printed by Ash and Pearce. "Road map of Island of Rhode Island or Aquidneck" - "Surveyed and published by Charles E. Hammett, Jr."
Black satin boots, marked "worn in 1849" Lacing over ankles. Black silk net, with embroidery on back. Thumb only. Signature quilt; 49 large blocks made by members of the Second Baptist Church; windmill Pattern; Old Stone Mill drawn in ink in one square. 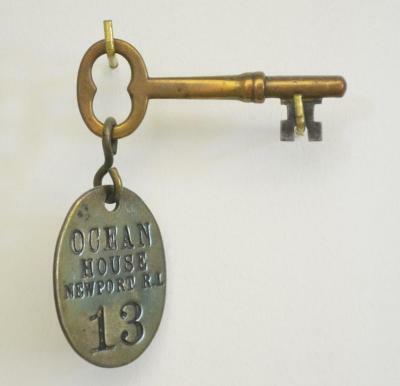 Brass skeleton room key attached by S-hook to brass tag, stamped "Ocean/House/Newport R. I./ 13". 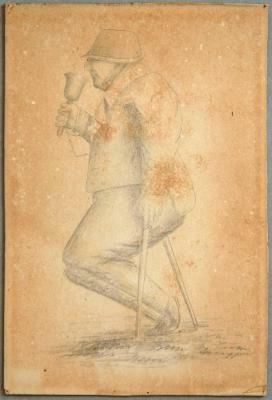 Stamped on reverse of tag: "John Robbins/Boston". 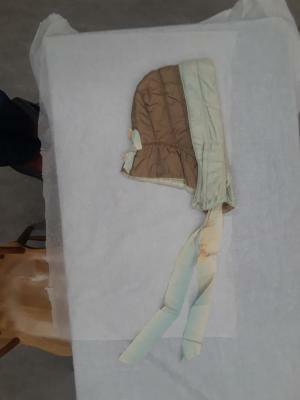 Chinese Girdle costume made from brown woven fiber. Oval dish with cover, silver-plate, with handle. For small platter. Supposedly used on Fall River Line steamer "Plymouth". Inside: "Plymouth" Rogers Brothers trademark. Silver cake server with CMC engraved on the front of the handle. Crosby and Brown Patent 1846 stamped on the back of the handle. Teaspoon, handles oval-shaped with leaf and scroll around monogram, "CMM". 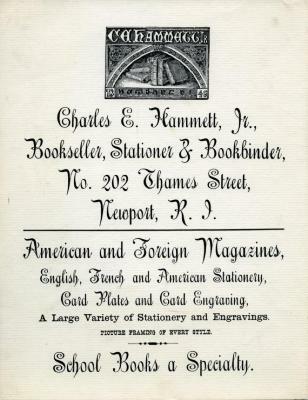 Marked with Palmer & Bachelders/Patent date 1846. 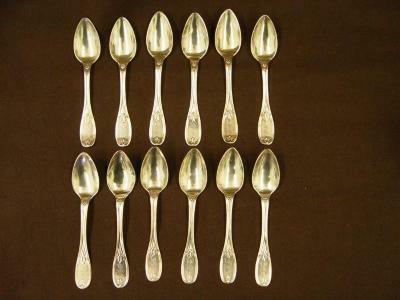 One of a set of 12 teaspoons: numbers 97.22.24 - 97.22.35. Very small plum colored bodice, short ruffled sleeves. Bodice comes to a point in front and back. Black lace around neckline. Fastens down middle. Black tread lace. 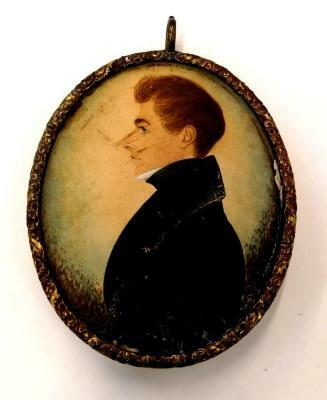 Bust length portrait, of Daniel Tisdale. Tisdale faces to the right, dressed in a black vest, jacket and bowtie with white shirt. His short hair is brushed back. Eyes are hazel.